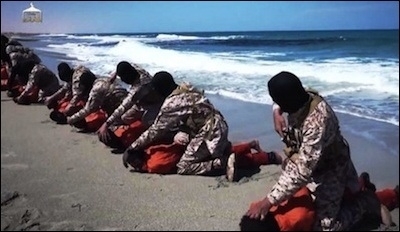 ISIS to Western Christians: "You Won't Have Safety ... Until You Embrace Islam"
Originally published under the title, "ISIS Slaughters Ethiopian Christians, Vows to Slaughter Western Christians"
Islamic State terrorists behead Ethiopian Christian migrant laborers in Libya on April 19. Approximately two months after the Islamic State (IS) published a video depicting its members slaughtering 21 Coptic Christians in Libya, on Sunday, April 19, the Islamic jihadi organization released another video of more Christians in Libya being massacred, this time for not paying jizya—extortion money demanded of the "People of the Book" according to Koran 9:29. Two scenes appear in the 29-minute-long video published by al-Furqan, the Islamic State's media wing. The first scene consists of a group of Christian Ethiopians dressed all in black, on their knees, with their arms tied behind their backs. Masked IS members stand behind the Ethiopians with rifles aimed at their heads. According to the video, this scene takes place in the city of Fezzan. The Christian captives are called "Worshippers of the cross belonging to the hostile Ethiopian Church." The second scene shows more Christian Ethiopians dressed in orange uniforms and standing on the shores of Barqa, the same region where 21 Egyptian Christians were earlier decapitated for refusing to convert to Islam. Other scenes include the narrator referencing the fatwas of medieval jurist Ibn Taymiyya that proclaim all Christians "infidels." Then Abu Malik ibn Ans al-Nashwan, apparently one of the group's leaders, appears saying that "The dealings of the Islamic State with Christians under its authority is according to Allah's Sharia [Islamic law]. Jizya [tribute] is imposed on those who accept, and war on those who resist." The Ethiopian captives refused renunciation of the Christian Trinity and conversion to Islam. The final scene is of the Christians in Fezzan being executed by gunfire to the back of their heads and the Christians in Barqa all having their heads carved off. It is likely that the reason these Christians "resisted" to pay jizya was that they did not have the money—migrant Christian workers in Libya, whether from Egypt or Ethiopia, are about as poor as they get. And they refused the only other option that could have spared their lives according to Islamic law—renunciation of the Christian Trinity and conversion to Islam. The narrator continued by saying that IS had "invited" the Christians of Raqqa, Syria to enter Islam, but they refused. So IS demanded of them payment of jizya and they complied and were permitted to live. Next follows a scene depicting Christians in Raqqa—according to the video's claims—saying how "peaceful" life is under the Islamic State, and that the caliphate does not compel them to do anything except pay jizya. Whether scripted or not—and odds are on the former—these supposedly "content" Christians are hardly representative of the overwhelming majority of Christians in territories annexed by the Islamic State. In the summer of 2014, IS issued a statement concerning Christian minorities, saying "We offer them three choices: Islam; the dhimma contract—involving payment of jizya; if they refuse this they will have nothing but the sword." Hours after this ultimatum was proclaimed, the jihadis began painting the letter "n" on Christian homes in Mosul—in Arabic, Christians are known as "Nasara," or "Nazarenes"—signaling them out for the slaughter to come and prompting a mass exodus of Christians from the region. Many older and disabled Iraqi Christians, unable to pay the jizya or join the exodus, opted to convert to Islam. "You won't have safety, even in your dreams, until you embrace Islam." In one instance, three Islamic State members burst into the home of a Christian family, demanding jizya. When the father of the house pleaded that he did not have the money, the intruders raped his wife and daughter in front of him. The man was reportedly so traumatized that he committed suicide. The new video of the executed Ethiopians shows other scenes and cities under the Islamic State's jurisdiction, including pictures of churches in Ninevah and Mosul being destroyed purportedly because Christians there did—or could—not pay jizya. Jihad in the path of Allah is greater than any individual or organization. It is a struggle between Truth and Falsehood, until Allah Almighty inherits the earth and those who live in it. Mullah Muhammad Omar and Sheikh Osama bin Laden—may Allah protect them from all evil—are merely two soldiers of Islam in the journey of jihad, while the struggle between Truth [Islam] and Falsehood [non-Islam] transcends time (The Al Qaeda Reader, p.182). This statement best encapsulates why the slaughter of Christians and other "infidels" will continue—regardless of whether we call the jihad "al-Qaeda," "ISIS," "Boko Haram," "Al Shabaab," or "Lone Wolf." Jihadi leaders, ideologues, emirs, sultans, caliphs, even the prophet of Islam himself, have come and gone for nearly 1,400 years—but the jihad rages on. And, lest Western readers in general, Christians in particular, think this is just happening "over there," the same narrator, speaking to the West in general, also said—right before the slaughtered and decapitated bodies of the Ethiopian Christians were shown—that "you won't have safety, even in your dreams, until you embrace Islam."